A charitable, volunteer-led organization, Canmore Seniors Association enhances the lives of our members through indoor and outdoor activities, social events and learning opportunities. Annual membership, $45 per year, is open to all seniors 55 years and older and runs from July 1 to June 30. Download printable CSA membership form 2019 2020 with waiver_180601. For details of this week’s activities, see Activities page. 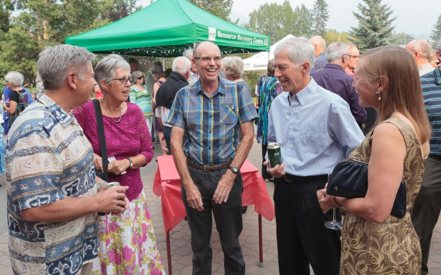 Our well-appointed downtown Canmore Seniors Centre halls and meeting rooms, including our patio and garden, are available to members and non-members for social events, meetings and celebrations. For more information visit our Rentals page. Contest has now closed. Thanks to everyone who has entered a team. Draws will start on April 22, and end at a Happy Hour at the Canmore Seniors Center on April 26. ALL members welcome, not just contest participants! Attend as a guest of a CSA member if a non-member. Bring an appetizer and come and cheer on the final winners! Beverages will be available at a cash bar, including a selection of wines from our wine sponsor, Canmore Wine Merchants. Twenty players eliminated in draw 1, and a further 15 in draw 2. All teams still in the running, but the Office Winers and Sipper Club are on the edge of elimination! Draw 3 Wednesday April 24 at 2:00 pm. View interim and final draw results and team standings on the Results page. The Board of the CSA has approved some changes to the rental policy and to one rental rate. Key changes for members are a 15% discount on all rental rates, and the introduction of rentals free of charge for "Any member who pays a reduced membership fee as per the CSA Reduced Fee program”. The rental rate for the weekend package for Creekside and the garden has increased from $1000 to $1200.